Inspired by motorbikes, the Tissot T-Race Marc Marquez incorporates the athletic body of the Tissot T-Race Limited Edition 2018. A case encircled by a fibreglass ring, pushers engraved with start and go and tyre tread marks all succinctly depict the speed and adrenaline of the race track, while a brake-disc bezel and bracelet that resembles the racers' suits conjure up the atmosphere of race day. 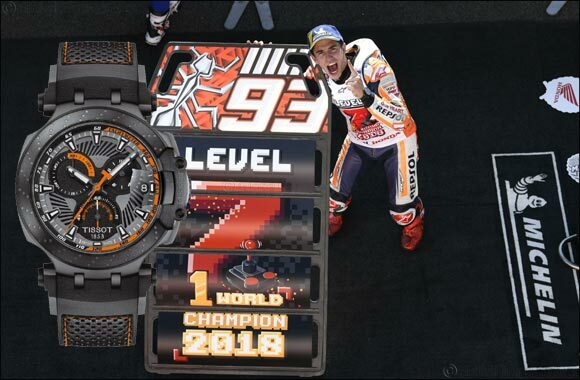 Marc Marquez's silk-printed logo is proudly displayed on the glass caseback making this limited edition, with only 4999 pieces available, very special indeed. Presented in a stylish helmet presentation box inspired by the design of Marc Marquez's racing helmet, it will make a significant collector's item for race fans everywhere. Next Story : Roger Dubuis Excalibur Skeleton Double Flying Tourbillon-"No Boxing No Life"